Is it possible for an ending to completely win you over? By completely I mean not having enjoyed most of the movie until its final moments, then wind up fully appreciating it? If there was ever a film to bore me then suddenly grab me, here it is. Having said that, most of my boredom was my own fault. I have a strict policy of knowing as little as possible going into a movie. I try not to watch and re-watch trailers, I don’t read reviews, I don’t pay attention to hype, and so on. So I literally knew next to nothing about this film. I knew it was animated war film, but that was it. What I plan to reveal won’t give anything away, but it may help to get a better understanding of what to expect. 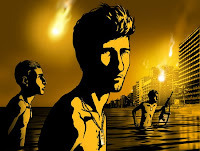 It’s helpful to know that Waltz with Bashir is essentially an animated documentary, with an added narrative. Ali, an Israeli filmmaker begins getting flashes from memories he suppressed during the 1982 invasion of Lebanon. Throughout the film he goes to each of his fellow veterans and gets their take on what happened. While each of them speak, we see an event from the invasion through the eyes of the interviewed soldier. Through his interviews, Ali begins remembering more and more from the invasion. And through the interviews, the film turns into an impressive, yet horrific, animated mashup. The images pulse with excitement as a rousing mix between 2 and 3-D. The final product is a marvelous and utterly original film spectacle. In summing it up: director Ali Folman is the man that interviews the subjects. His fellow veterans really do play themselves. It’s their face, their voice, just animated. I didn’t figure this out until it was too late, and with only a few minutes left, I was trying to catch up with the rest of the film. If this was a fictional piece, I don’t think I would’ve enjoyed it. But because Folman has the audacity to present this story in animation, it makes for very unique stuff. The final images was so haunting that it gave me chills on my spine. That never happened before when I saw a film. This film, funny enough, can rank as one of the best animated film I ever saw. I consider almost all the animated films to be style-over-substance, but there are many that are fantastic and this is one of them. Yep, couldn't agree more. The final images make the film come together in the best, most haunting way possible. It's a thing of wonder, really.